WSU physicists have a new laboratory in outer space. On May 20, the Cold Atom Laboratory (CAL), a remotely operated research platform, blasted off for the International Space Station (ISS) where it will be used by researchers to probe quantum phenomena that would be impossible to observe on Earth. Professor Peter Engels and graduate student Maren Mossman will use CAL remotely to study the behavior of atoms chilled down to just a few billionths of a degree above absolute zero, the point where they behave like one wave instead of discrete particles. Their research will be the start of a new chapter in the study of quantum physics that could eventually help in the development of ultrapowerful computers and a wide variety of advanced sensors for taking measurements of quantities such as gravity, rotations and magnetic fields. The Cold Atom Laboratory is designed to study ultracold quantum fluids in the microgravity environment of the International Space Station. On Earth, the unavoidable presence of gravity makes it difficult to conduct unperturbed observations of this super cooled substance and the laws of quantum physics that govern its wave-like behavior. However, in the ISS’s microgravity environment, Engels, a professor of physics, and Mossman will be able to use CAL to create and study ultra-cold atomic clouds for up to 10 seconds at a time, unlocking the potential to observe new phenomena never before seen on Earth. The remotely operated project made the roughly 240-mile voyage to the ISS from NASA’s Wallops Flight Facility in Virginia onboard U.S.-based Orbital ATK’s Cygnus spacecraft. 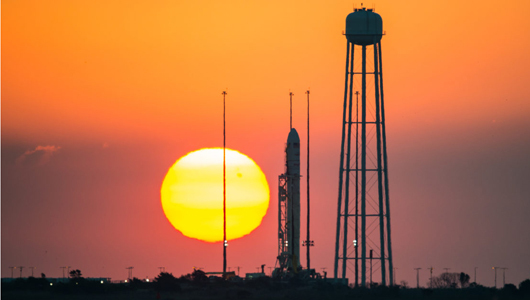 Top image: The Orbital Sciences Corporation Antares rocket, with the Cygnus spacecraft onboard, is seen on launch Pad-0A during sunrise, Sunday, Oct. 26, 2014, at NASA’s Wallops Flight Facility in Virginia. Photo Credit: NASA/Joel Kowsky.